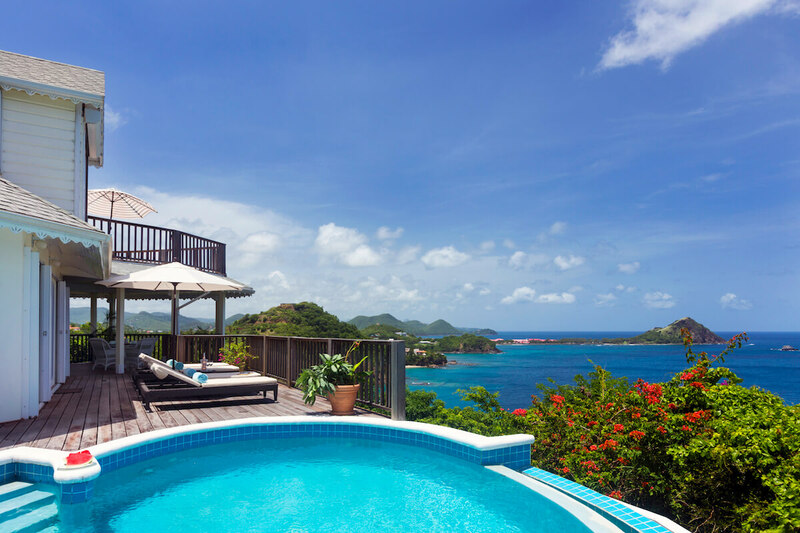 This cozy villa may be in a quiet part of the island, but that just makes the views even more beautiful. Not only does the pool terrace maximize the vistas, but the master suite also has bay windows that soak up the sea. The second bedroom opens right to the pool, so you can gaze at the ocean from bed in both suites. You can relax all day thanks to the villa’s housekeeper, who keeps things tidy and can even cook for you. Infinity pool with impressive view! Lemon Tree sits on a cliffside location in the beautiful Saline Point, one of the most exclusive areas of Cap Estate, itself the most prestigious neighbourhood in St. Lucia. This amazing 2 bedroom villa enjoys one of the most stunning panoramic views out to sea. Gaze upon historical Pigeon Island to the left, Martinique to the right and out to sea directly north. The villa comprises two levels, the Master Suite located on the top floor with its own private deck, porfect for sun tanning, reading a good book or just enjoying the view. Master has a queen size bed and an ensuite bathroom. The Guest Suite located on the main floor opens out directly onto the deck and infinity swimming pool. This bedroom has two twin beds which can be converted into a king and also has an ensuite bathroom. This level also includes the fully equipped kitchen, and an open plan main living & dining room. This area opens out onto the patio and deck which wraps around the entire front of the house affording much open space in which to enjoy the fabulous views. Part of the patio is covered which allows for alfresco dining but there is a formal dining area located inside also. Let the housekeeper take care of you and prepare some wonderful local dishes. The property is situated high above the Caribbean Sea with panoramic views over Anse Du Cap Beach and to Pigeon Island National Park. The villa was absolutely beautiful and the views were amazing, the pictures don’t do it justice. The views of the surrounding mountains and Pigeon Island were beautiful. I can’t say enough about Mary, the longtime housekeeper, she was one of the many great parts of our stay. She made us breakfast several times and lunch as well. Her salad dressing was incredible! She truly was a joy to be around and talk to. The owner and management were very responsive when we had questions and went out of their way to accommodate us. WhereToStay was great to work with and Andrew was awesome. I would definitely use WhereToStay and Andrew again for another vacation adventure. My husband and I stayed at the Lemon Tree Villa for 7 weeks and could not have been happier with the villa, the location and the staff. Beautiful views of Pigeon Island, the surrounding mountains, turquoise waters, and Martinique to the north. Mary, the longtime housekeeper, was one of the highlights of the stay. Her meals were incredible, she took such great care of us, and she was a delight. The owner was very responsive and helpful. The house and pool were beautiful, and we spent most of our time outside on the veranda overlooking the beautiful water. The space was beautifully decorated and roomy. We rented a car for the duration and traveled around the island visiting Soufriere, Marigot Bay, Rodney Bay, and Castries. The island itself is very beautiful and well worth visiting. Overall, I cannot say enough nice things about the villa, staff, and our stay. We highly recommend this property and will definitely be back! Great, Andrew was very responsive throughout the process. He handled the villa booking, car rental and assisted us in transportation from the helicopter port to the villa. We stayed at this villa for 7 days and we loved every single moment! First of all, the views at this place are worth a million bucks, especially the sunsets. Breathtaking! It is truly the most exciting part of staying here. We always ate our breakfast and dinners outside on the balcony even though it was always around 80 outside. It wasnt hot, but the perfect combination with the salty ocean breeze! The villa was very clean and very welcoming. Large, spacious open area and sitting room for many people. Mary was our housekeeper and cook and she was so pleasant! She makes the best Creole food! That was another thing we were so fasinated about, coming home from an adventure to a warm home cooked meal! While being in St Lucia we visited Pigeon Island National Park (which you can see from the balcony) and took in the beautiful views from the high peak! Next we rode and swam with horses, just a 10 minute drive from the villa. Next day, we took a catamaran to soufrière and did a tour to the botanical gardens. Then we took a mud bath in mineral waters from the volcano, had lunch, and snorkeled before heading home. What an adventure! The best experience was ziplining in the jungle in Denerey - unforgettable! The next 2 days, we relaxed at the villa. It was quite an adventure being here in St Lucia!! We really felt relaxed coming home to this beautiful place after a day of exploring! All was phenomenal!! Wheretostay treated us very wel,l took care of all questions, and made us feel like we had our own vacation planner… took care of the auto rental and groceries and all questions villa related. We didnt have to worry about anything. Thank you Andrew! !